Over 3 days in 1865 from July 1st to July 3rd the battle of Gettysburg was fought in and around a small town in Pennsylvania, leaving thousands dead and wounded in its wake. Many of the fallen lie forgotten beneath what is now considered hallowed ground. Tales are still told of the ghosts of Gettysburg’s long dead solders and the sounds of phantom gunfire that still echo’s across the blood drenched battlefields over 150 years later. I had spent most of the day touring both the town and parts of the battlefield that surrounds haunted Gettysburg and I was now in my room at the Farnsworth Inn waiting for darkness to fall. It was a Monday night in mid October, and I had deliberately chosen this time of year to avoid the crowds that flock here in the summer months. It was also just before there were to be new restrictions placed on the battlefields opening hours, so this was one of the last opportunities to visit the park for any length of time after dark. I had been studying the historical aspects of the battle for several weeks before I came out here from California and earlier on that morning I had made a trip to the official Gettysburg visitor’s center and exhibition so I felt I was beginning to know my way around the area. There were specific locations I planned to visit that night all of which had been chosen for their reputation as having a high level of paranormal activity. It was now about 7 pm and finally it was dark; the battlefield was in close proximity so it would give me about 3 hours before the park officially closed at 10. I packed my camera gear and left my room at the Farnsworth Inn to go to my rental car which was parked out back. The sky was clear and moonlight but it was cold out. As I drove down Steiner Street I noticed the road was far less busy then it had been on the previous nights. There are only a few routes out of Gettysburg and the one I took passed through the town center and towards the battlefield. After a few blocks I got to the outskirts of town and was heading pass the national military cemetery and the visitor’s center, which were both on my left. I hadn’t yet had dinner so I stopped off to get some fast food to eat in the car when I got to the battlefield. Just at the edge of haunted Gettysburg, there is a distinct cut off where you enter what is now a national park, and the rows of restaurants, motels and houses come to a sudden stop. Great efforts have been made to ensure that the solitude of the battlefield has been preserved and respected and although the town itself does have some trappings of a more modern world overall I wouldn’t say it has been over commercialized. And ultimately it is the steady flow of tourists which is helping to pay for the parks restoration and upkeep. Aside from the historical draw of the battle a significant part of the income that is generated from tourism involves people that are drawn to the area because of their interest in the paranormal. There are perhaps a dozen different ghost tours and other attractions that cater to some aspect of this and the revenue generated as a result of their influx both for the town and the battlefield can’t be underestimated. It should however be noted that the national park service doesn’t allow any commercial ghost tours of the battlefield, which are confined to the town itself which has more then its share of haunting’s. I’m now heading North along the Emmitsburg road, and within a ¼ of a mile of the town you are already in the heart of where some of the most intense and strategic fighting took place. Much of it was at night and beneath the glow of a half moon it is easy to conjure up images of the opposing army’s fighting their way across the wide open expanses either side of me. The road I am driving along pre dates the battle and had its own significance in the fighting. 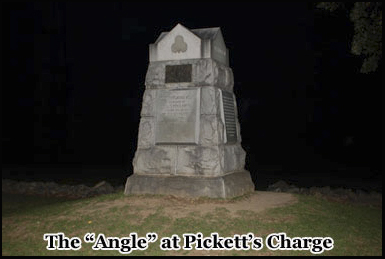 It actually interse cts the area over which the infamous Pickett’s charge took place. Over 12000 men marched across almost a mile of open ground into a Union onslaught of cannon and gunfire in one of the last desperate actions of the confederate army. In reality the fighting didn’t take place only on certain parts of the battlefield, with over 160,000 troops involved everywhere was a battlefield and that includes the town itself. Perhaps this is also one of the reasons that there have been more ghost sightings here then just about any other place in the world. As I tried to peer across the now dark fields of haunted Gettysburg, beyond the farthest points of the cars headlights it is easy to imagine that phantom soldiers still fight one final time just out of view. I wound down the window letting the cold night air sweep in from outside. I find that this makes it feel as if you’re more connected with your surroundings rather then just observing them from within the confines of your vehicle, this is also the reason I never have the radio on when I visit somewhere like this. All was quiet, but on many occasions gunfire and other unexplainable sounds of battle have been reported. I was one of the few cars on the road that evening so I could drive fairly slowly along side the battlefield, as I searched for the turn off to the left which would take me towards the area known as the Valley of Death, which is adjacent to Devil’s Den and beneath the slopes of the hill leading to Little Round Top. I had been there earlier on in the day, but as there are no streetlamps and few houses to point the way, at night it is not so easy to find. As soon as I turn from the Emmitsburg Rd I am within a national park. The roads become narrower and barely wide enough for two cars to pass, the maximum speed limit drops to 25 miles per hour and you become aware that you are at a place where something of great significance has occurred. 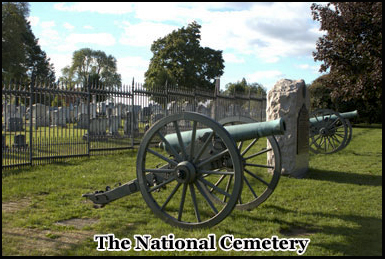 Throughout the battlefield there are literally thousands of markers, monuments and cannons placed at key locations. They indicate where specific elements of the battle took place and the positions of various regiments and artillery batteries. This does assist in bringing the e vents to life as when you pass them you become aware that people fought and probably died in the immediate vicinity. The Confederate marker’s, have a round base and the base of the Union markers are square. 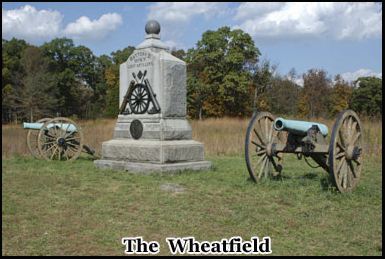 There are smaller stone markers that designate the extreme left and right hand flanks of a regiment and flat black plaques positioned on top of cylindrical pedestals that indicate the location of artillery. I headed on down Wheatfield Rd for about half a mile, and then made a right on Crawford Avenue. At this point I seemed to have the battlefield to myself. To my left is a large expanse of open ground that sweeps up the top of the hill, which is known as Little Round Top. 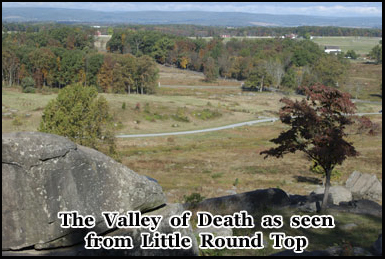 This area is referred to as the Valley of Death, it was here on July 2nd 1865 that Union soldiers under the command of General Romeyn Ayres fought with Confederate troops led by Brigadier William Woodford that had captured Devil’s Den and were launching an assault towards the top of the hill. In the aftermath lay over 900 dead, the bodies lay scattered throughout this now overgrown field a few yards away from me for weeks after the conflict ended. Further up the road there is a cut off about half way along which is just wide enough to park my car. I pulled over to the right hand side, turned off the engine, and shut off the headlights. There is a stillness about the area as if, after all the bloodshed and conflict the land has become tainted. I have been to haunted places all over the world and this is one of those moments that will remain with me, sitting in the car alone beneath a moonlight sky, on the slopes of Little Round Top in haunted Gettysburg. It’s now that I can begin to recall images from the movies I had seen and books I had read about the battle and begin to mesh them into reality. I sat in the car for about 20 minutes eating my dinner. Barely visible to my right is a small gully that runs through the Valley of Death, it was nicknamed Bloody Run as the water was supposed to have run red with the blood of the dead and dying. As I gaze up the hill towards Little Round Top every now and again I noticed small flashes of light, then occasionally I could hear distant voices being carried closer in the wind. Although it would have been easy to imagine otherwise these were obviously others also interested in finding out what may walk the battlefield now that night was here. There is always something particularly eerie about battlefields and in this instance what adds to the atmosphere is that there are no major towns within many miles of here and Gettysburg itself is still small and rural. There are no distant sounds of traffic and very few intrusions from a modern world. I started the car and drove about a hundred yards further along the road; there is a turn off to the left known as Warren Avenue which ascends the hill and runs across the crest of Little Round Top but I was heading to Devils Den which is a few hundred feet on the right hand side. This area is one of the most well known in the battlefield and also supposed to be among the most paranormally active. Famous ghost sightings include that of a phantom soldier thought to be from a Texas regiment that fought there during the conflict and in addition to this there have been several other apparitions that people have reported seeing and on occasion photographed among the giant boulders. As I entered the parking lot I passed a few people walking their dog on their way back to there cars but aside from that it was empty. 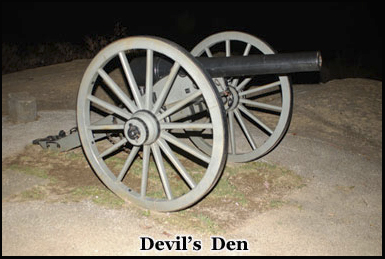 Devils Den is actually a series of large boulders that are scattered around an embankment at points reaching up as high as fifteen feet. It was here that on July 2nd Union Captain James Smith and his regiment the 4th New York Battery were overrun by Confederate troops after being attacked from three different directions simultaneously. The Confederates the n positioned sharp shooters among the rocks, using them for cover in order to pick off other Union Soldiers stationed along the Ridge of Little Round Top. I parked the car, got out and walked across the grass on the other side of the road towards the center of two enormous boulders. There is a one particularly rock formation which is now directly in front of me, that was made famous as a result of a photograph taken there of a dead Confederate soldier. It later turned out that the photographer had in fact moved the body from another location and staged the scene. But staged or not the fact remains that where I am now standing and taking pictures myself, over 150 years later a dead soldier once lay sprawled between the rocks, rifle still at his side. I walked a few yards to the right and climbed up through a gap in the boulders where there is a set of steps cut into the hill. I am now about fifteen feet above the car park and I could look out towards the top of the hill to the left which is Little Round Top. The view wouldn’t have been much different to that of when the battle was originally fought, although the roads have been added to accommodate visitors to the park much of the terrain has been left unchanged. To the rear of the boulders behind the Devil’s Den the ground is level. There are several cannons that mark the positions of the gun batteries that were stationed here. 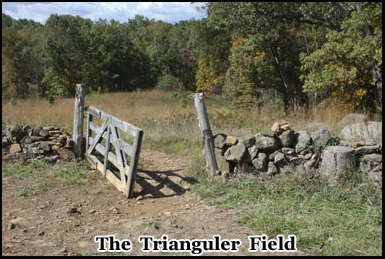 Beyond that a few hundred feet to the left is the Triangular field. I walked silently among the rocks taken pictures at random and until I crossed over the small road that ran along side. In front of me set several yards back is a low stone wall, with a partially opened wood gate across its center. I turned on the flashlight that I had hanging from my belt and shone it across the field that lay beyond the gate. I followed the embankment down from the road and walked through the opening in the wall. This is where Confederate troops from Texas and Georgia fought Union troops from the 124th New York division commanded by Major James Cromwell who also died here when he led the initial charge against them. 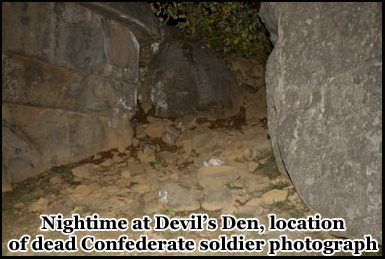 The field is Triangular in shape and at the far end where I shone my flashlight towards the perimeter of trees troops would have charged through the undergrowth across the open ground and onward’s to their ultimate objective of capturing Devil’s Den. There was also once a gun battery of Union cannons positioned here until they were abandoned to the Confederate onslaught but not before many died trying to overrun them. The woods behind seem exceptionally dark and there is an unsettling feeling about being here. One of the most common possible paranormal occurrences that have been reported in this part of the battlefield is the malfunction of people’s cameras or that the batteries that power them have inexplicably drained. I made my way up the embankment and circled down the hill walking in the middle of the road, keeping an eye out for any cars that may have been coming in my direction. Once in my own vehicle I headed for Little Round Top. On the way out of the car park on my right hand side there is another smaller formation of rocks with a shallow pond at the base, this was known as the Slaughter Pen. This is another area that has been reported as having a high level of paranormal activity. Just beyond, the road climbs along side the Valley of Death for about a quarter of a mile and then at the top curves around to the left. As I neared the summit I tried to imagine men charging up the hill, and the hail of bullets and cannon fire raining down upon them. The nature of warfare was very different then compared with today, and as a result the casualties were usually much higher. There are lines of trees on both sides of the road and on the left there is a car park which runs to the rear of the western edge of Little Round Top. There are a few vehicles here already, but it is a fairly long stretch of mountaintop so it will still be fairly secluded. I walk through a gap in the trees and just beyond are a series of intersecting paths that run across the top of the ridge. I followed the first one I came to which ran along to the left hand side. On my far right I could see a few people huddled together and the occasional flash of a camera. But in this section it was just me. Little Round Top was first occupied on July 2nd when it became one end of the Union flank, the start of the fishhook formation that ended a few miles away at Culp’s Hill. The troops positioned here were commanded by Major General Gouverneur Warren, and Colonel Strong Vincent. It was also at Little Round Top tha t Colonel Joshua Chamberlain of the 20th Maine led the famous bayonet charge on the extreme left flank of the hill that ultimately secured the position against the Confederates that were commanded by Colonel William C Oates. From where I stood on the edge of an overhang on top of the hill I could look back down over the Valley of Death and towards, the Devils Den. Over to the right I could see the illuminations of the Pennsylvania Monument, which lies near the center of the main battlefield just before the High Water Mark. Beyond that you can see the distant lights of the town. Beneath a moonlight sky haunted Gettysburg makes for an eerie landscape. But as I make my way along the path that snakes across the hill top you cannot help but remember that you are literally walking in the footsteps of historical events that shaped an entire nation. Aside from a digital camera I also have a video camera with me, so at this point I shot some footage using night vision as I made my way towards the north side of the ridge. All the way along the path are regiment markers as well as several cannons depicting the former positions of gun batteries and there is also a life size statue of Union Commander Major General Warren peering out of the Valley of Death. I cut back through the rear of the tree line and made my way over to the car. Just a few hundred feet down the hill to the left along a path in the woods was where Colonel Josh Chamberlain had successfully defended the flanks of the hill. After running low on ammunition he ordered a bayonet charge against the attacking confederates. I had been there earlier on in the day and if you have ever seen the film Gettysburg this was one of the most memorable scenes in the movie as the soldiers charged down through the trees bayonets at the ready. 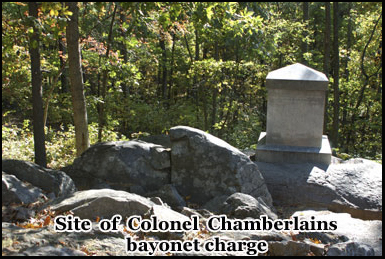 26 of Colonel Chamberlain’s men died in the defense of Little Round Top and perhaps this is where they will always remain. The street is one way so I have to return down the hill via Sykes Avenue, and make a left on Crawford until once again I am at Devils Den, this time I head past it and towards the Wheatfield. Just beyond there is a fork in the road. To the right is the more direct route but to the left is Cross Avenue. This road is much narrower and far more isolated and is one that few people travel along even during the day. It will lead to the Wheatfield but not before it twists its way through an avenue of dark over hanging trees. I decided to take this one, I had already been down here once in the early afternoon but at night it would be a very different experience. Although it is not far from many of the battlefields more popular locations this section has somewhat of a forgotten feel to it. All the way along hidden beneath the trees and undergrowth are more battlefield markers and several white life size statues that beneath the car headlights do look like someone is standing there. A few are perhaps to realistic, as if when you pass they could almost be turning their heads to watch you fade into the darkness. And maybe you can’t help but press a tiny bit harder on the accelerator, to take you back to the main road that lies up ahead. But you really can’t go very fast even if you wanted to, as the blind curbs and poor visibility make it impossible. Eventually Cross Avenue does take you to the Wheatfield which is now on my right hand side as I emerge from the intersection. It is a large open field within an expanse of trees. I got out of the car and looked out across the grass, most of which is long and overgrown, but there is a path cut through it that leads to a monument to the 27th Connecticut’s. On July 2nd fighting took place between the Union troops commanded by Colonel John Brooke and the Confederates led by General Joseph B Kershaw that resulted in possession of the field changing hands 6 times, and leaving more then 4000 dead and wounded. I walked about 50 yards towards the centre of the field pointing the camera at random and taking a few pictures. Each time light from the flash provides a fleeting glimpse into the darkness before it quickly fades and everything returns to silhouette. I still had several more places to visit so I headed back to the car. The wind was picking up slightly and I felt a few drops of rain. My next stop was towards one end of the battlefield, Pickett’s charge and the area known as the High Water Mark where on July 3rd the fighting reached its peak. After about half a mile Wheatfield Road connects with Sickles Avenue, I made a right on United States Avenue and then onto Hancock. I am now heading in the direction of the town. On my right hand side is the Pennsylvania State Memorial; this is visible for many miles throughout the battlefield. It is a vast structure crowned with a marble dome and engraved on its walls are the names of all 34,500 Pennsylvanian soldiers that fought here. Either side of the road there are cannons positioned in formation to show the original position of the Union gun batteries. The Confederates would have attacked from the fields and slopes to my left. Up ahead in th e dark the headlights pick out a single clump of trees. 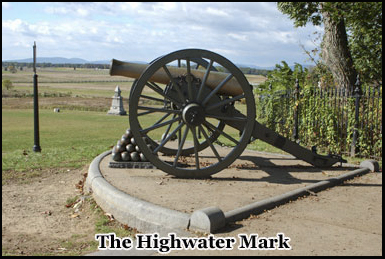 This is what is known as the High Water mark, because it marks the area where not only was the fighting most intense but also the point where the Confederate army came closest to overrunning the Union Ranks. I pull over on the other side of the road a few feet down from the trees. I got out the car and crossed over the grass to the right hand side. Bordering the area in front of me is a low stone wall. This is what is known as the Angle and was a crucial both in the Union army’s defensive strategy and also a major objective for the Confederates whose battle lines were massed over a mile away along Seminary Ridge. At one corner there is a gap in the wall, I climbed through it and stepped down into the field beyond. Unlike the grass section behind me this area had been left overgrown, and the ground was rough and uneven with a noticeable slope to it. In front of me the field spreads across to the left, to the front it is only intersected by the Emmitsburg rd before it continues to barley visible tree line over 1/2 a mile away. 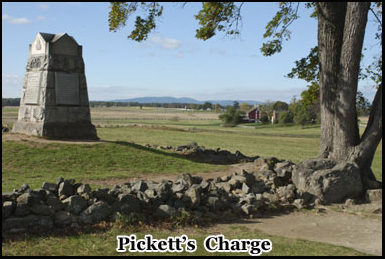 It is here in the area marked by the Virginia Memorial that one of the most famous actions of the battle took place, the event known as Pickett’s charge. In one of the last major actions of the conflict nearly 12,000 Confederate soldiers under the command of General Longstreet charged over almost a mile of open ground. Mown down by gun and cannon fire from the 7,000 Union troops that would have been stationed behind me there was almost a 50% casualty rate. The assault which took place on July 3rd lasted just over an hour. The landscape is largely unchanged. There is little in the way of cover and even if retreat had been an option the confederate troops would have easily been picked off before they could make it out of range of enemy artillery. From where I’m standing on this dark sloping field beneath a moonlit Pennsylvanian sky, the area where Colonel Pickett and the other Confederate commanders began their charge that day is just a faint outline on the horizon. It is remarkable that any of them made it this far but a handful did, and fierce close quarters fighting took place all along the battle lines around the stone wall behind me. Confederate General Armistead led a brigade of around two hundred men that breached the Union defenses before he was fatally injured and a few of Colonel Pickett’s men also made it across. The immediate area where I am now must have been blanketed in the dead and dying. I walked on down into the field cutting across in front of the crop of trees that was the High Water Mark until I was about half way between them and the Emmmitburg Rd and. This was the actual direction that Pickett’s charge came from and not along the official trail that cuts across from the Virginia monument as most people assume. I started walking back up the hill towa rds the Angle. Colonel Pickett and his men would have swept across here from South to North; up ahead close to the area where I first entered the field is where Colonel Trimble took a more direct route. Both he and Colonel Pickett survived although Trimble did lose a leg. Most of Pickett’s division was from Virginia and in the far distance to my left you can just make out the outline of the Virginia Monument which marks the approximate line that the soldiers set out from. The Confederate brigades were spread out over almost a mile as they began their convergence on the Union positions. The terrain is quite rough and uneven and as the stone wall of the Angle looms up in the darkness and the outline of the trees at the Highwater Mark gets closer you realize that for a large number their march would have been certain death. No doubt many fell along the exact same the path I was taking. There is no cover and the fact that the ground slopes slightly upwards meant there would have been nowhere to hide, even for an instant. After just a few hundred yards the walk starts to get tiring, so doing this in battle conditions at full charge while all manor of gun and cannon fire reigned down upon you would have been hell on earth. It must have seemed like a false victory to be one of the first few that made it up the hill only to be met by the awaiting Union guns. As I got closer to the trees marking the High Water Mark I cut across in front of them to the left. Beneath this ground undoubtedly lie fragments of cannon balls, and bullets from the battle, and in all probability bullets that killed the men that fell here. I crossed back close to the stone wall pausing for a few moments to try and picture what it had been really like to make that fateful charge, but as nothing more then a tourist ultimately you will never truly be able to. I followed the wall back to the far corner and stepped back through the gap, once again on the flat ground adjacent to the road. I took one last look into the dark behind me, and headed off back to my car. The last stop tonight was Culp’s Hill this is one of the main points of interest if you are in search of haunted Gettysburg and it’s one that even during the day many tourists seem to avoid as it’s away from the main battlefield. At nighttime it geographic isolation insures it remains strangely apart from its more famous counter parts across the other side of the Baltimore Turnpike. As I cut across Taneytown Rd to Hunt Avenue I felt certain that I would be the only one there. It was now about 9.15pm and as the park officially closed at 10 pm most of its more casual night time visitors had already left. During the day the entrance to Culp’s Hill is not easy to find and at night it’s almost impossible, particularly if you’re not familiar wi th the area. There are no streetlights and it’s not well marked so I had to drive up and down the main road several times before I found it. Finally just off of the Baltimore Pike I came to Colegrove Ave. As soon as I made the left turn and began my drive along what is a fairly narrow single lane road the dark seems to creep in around you. The trees reach across to each other to obscure even the moonlight and you get this sense of having crossed from a more modern world into one which you are intruding upon. The wind has started to pick up considerably, the car windows are still rolled down but I have turned on the heater as it gets noticeably colder as the road starts to climb. Soon you come to an open stretch of ground, called Spangler’s Spring. At one time this area was occupied by both Union and Confederate troops. Just to my left I can see an indentation in the ground with a small brick wall that curves up over a grass embankment. This is the actual site of the spring. Bitter fighting took place here between the Union brigades led by General Greene and the Confederates led by General George Steuart and possession of the spring changed hands several times between the opposing sides. Union Lieutenant, Colonel Charles Mudge led the 2ndMassachusett’s and 27thIndiana on an almost suicidal charge against the Confederate position that resulted in his own death as well as heavy fatalities amongst his troops. 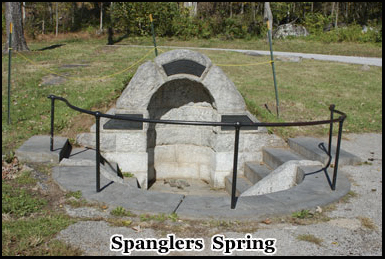 Spangler’s Spring is also where another of Gettysburg’s most famous haunting’s occur. Around the area of the Spring and among the trees to my left the phantom shape of a women in white has often been seen. People have also reported seeing dark shadowy figures in the same area. As I slowly pass by I peer across through the open window, seeing if I catch anything in the beams of the headlights. The park will be closing soon, so I am beginning to run out of time. I’m unable to stop but I continue along Slocum Ave on the way to the summit of Culp’s Hill. Within a few yards there is a point of no return, there is a fork in the road. Make a left and it will take you to the Baltimore Turnpike, take a right and you continue the ascent through what is now a rather dark and ominous looking section of winding road that takes you to the top of the hill. I make a right. You can now hear the wind blowing around the hilltop, and the woods start to come alive as you see the tree branches move and leafs fall and drift across the road in front . This is a one way street, and you can’t just hang a u turn and go back to the real world. It would actually be a very difficult if not impossible maneuver to do even if you could, as you’re either boxed in by trees or by an embankment, and at this point I really would rather not have to stop or reverse even for an instant. This is the closest I have ever been to feeling like I was in an Evil Dead movie. I think it’s the woods and the strange noise that the wind is making. Its pitch black now, I have the high beams on, but maybe I would be better off not seeing to far ahead. The road starts to climb steeply, and the pitch of the engine rises slightly as I push on to the top of the hill. As I leave one haunted location behind another one looms up in the dark ahead. All along this part of the road people have reported hearing people screaming in the woods, and seeing strange flashes of light. Many of the statues and monuments are at twists in the road so you don’t see them at first and then in beams of the headlights they suddenly appear. But I am close to the summit now, which is over 500 feet above ground level. As you round one last curve you come across an observation tower that stands at the peak. I pull the car over to one side and get out. The wind is more intense and it’s far colder up here then it was at the other parts of the battlefield. The area where I am now was the furthest most point of the Union battle lines and the formation here was often referred to as a fish hook stretching out several miles from here to Little Round Top. I am now right at the tip of the hook. The position was first occupied by Union Troops July 1st. 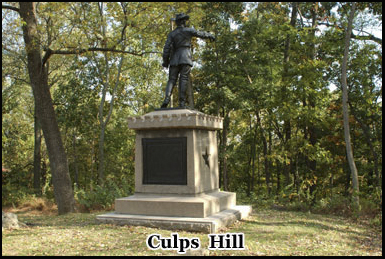 At dusk on July 2nd troops commanded by General Ewell of the Confederate army charged up Culp’s hill. They fought with the Union troops of Brigadier General George S Greene who had been left to hold the top of the hill after his reinforcements had been sent elsewhere. The Union troops were outnumbered 3 to 1. I walked to the centre of the island beneath the observation tower. Footsteps have been heard echoing upon the metal rungs when no on was there and a women has passed by visitors climbing the steps to the top only to vanish. This is truly the most isolated part of the battlefield. You are at the top of a hill with a single narrow one way track leading too it and another equally narrow one leading away. From where I am, you can’t see any city lights or houses to connect you with the 21st century. And even if you wanted to leave in a hurry it’s at least a 5 minute drive down a long dark windy road. 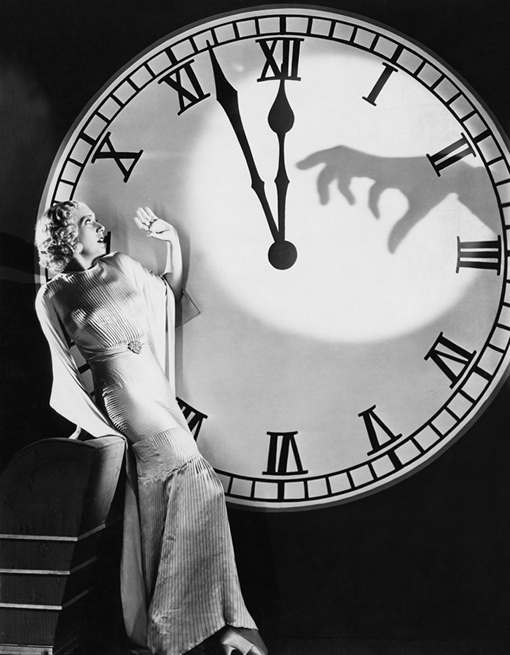 And 5 minutes at this time of night when you’re alone, and in this location seems like an hour. Where as places like Devils Den and Pickett’s Charge may be more famous, it was here that Union army was in one of the greatest dangers of being overrun. Not only was this a key location that protected their supply lines but if it were breached it could allow the Confederates to march onto Baltimore and ultimately Washington. The fighting was intense and bloody. There is one description recorded by a visitor that came here soon after the battle in which he wrote, that the bodies in the area around me were stacked 3 deep. I shine my flashlight up to the top of the observation tour, and then back down the road I just came in on, sweeping the beam around to the other side which is the way down. With this particular battle, much of it was fought through the night, all the way until dawn. Hundreds of men would have rushed through here beneath a hail of bullets and cannon fire. The devastation was so great that many of the trees were shredded or were literally blown apart. Although ultimately they were victorious the Union Army must have felt very venerable here on top of the hill. There is certainly a feeling of being trapped and with the cover of darkness and the surrounding forests it must have been very difficult for them to even see their opponents before they were upon them. It’s almost 10pm and in another few minutes the park officially closes. I head back to the car and set off down the hill, alternately trying to peer just beyond the range of the headlights to see what’s ahead and glancing in my rear view mirror. As I descend back down into the valley the road splits once more. Straight ahead and its back on to the Baltimore Turnpike and civilization, or to the right there is another turn off that will take me back to the town centre via a small secluded road that runs behind cemetery ridge. I took that one. It dips down behind a series of hills on the left, which still have cannons stationed on the crests to mark the gun batteries. Just beyond them and across the other side of the road is the national cemetery where at least some of the men that fought and died at many of the battle sites I visited today are buried. Glancing behind and to the right I can still see the distant outline of Culp’s hill. It now seems a long way away, and on the night of July 2nd 1863 for the men that fought over it, it must have seemed unreachable. Eventually the road emerges towards the center of town. But in reality you are not leaving the battlefield as in haunted Gettysburg over those 3 days from July 1st to July 3rd 1863 everywhere was a battlefield. The fact that houses, businesses and hotels now stand where men once fought and died cant change that fact. And as my moonlight journey comes to a close, in the darkness behind me, perhaps one last battle is now being fought. Hey Buddy!, I found this information for you: "Haunted Gettysburg – In Search Of The Ghosts Of The Civil War". 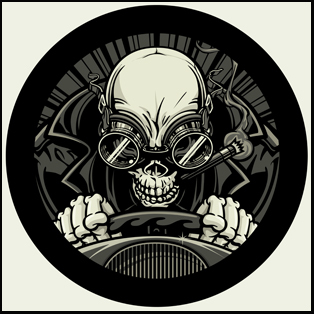 Here is the website link: https://www.chasingmidnight.com/haunted-gettysburg. Thank you.